Parkinson’s disease is a brain disorder that erodes motor control and balance over time. It affects some 500,000 people in the U.S., according to the National Institutes of Health. The disease occurs when neurons—nerve cells—in the brain that control movement become impaired or die. Normally, these neurons produce dopamine, and when they are damaged or killed, the resulting dopamine shortage causes the motor-control problems associated with the disease. University of Iowa researchers have found that the gut may be key to preventing Parkinson’s disease. 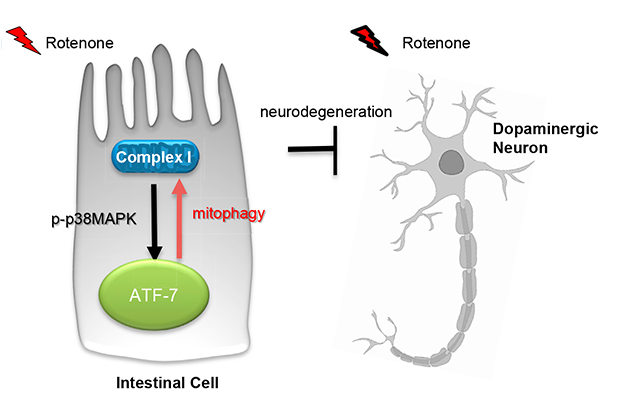 Cells located in the intestine spark an immune response that protects nerve cells, or neurons, against damage connected with Parkinson’s disease. Acting like detectives, the immune intestinal cells identify damaged machinery within neurons and discard the defective parts. That action ultimately preserves neurons whose impairment or death is known to cause Parkinson’s. Illustration courtesy of Veena Prahlad. Scientists have previously linked Parkinson’s to defects in mitochondria, the energy-producing machinery found in every human cell. Why and how mitochondrial defects effect neurons remain a mystery. Some think the impaired mitochondria starve neurons of energy; others believe they produce a neuron-harming molecule. Whatever the answer, damaged mitochondria have been linked to other nervous disorders as well, including ALS and Alzheimer’s, and researchers want to understand why. Academic Panoramic: What's new about getting old?